Evangelical Churches are known for two features: an emphasis on personal relationship with God and missionary activity. Both features distinguish them from historic churches. The latter emphasizes the importance of tradition and history: tradition itself includes a new person into the community of faith and limits the role of the individual, while the historical-cultural and political significance of the Church in society attracts people far more than the missionary appeals. Today, both evangelical and historic Churches have been presented with the challenge of Maidan. Already there is enough of “only” personal faith and evangelism, or only tradition and “appointed” authority. 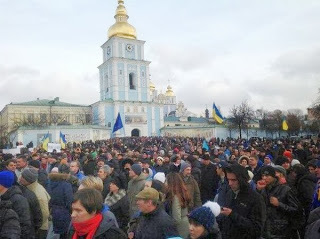 What is happening on Maidan shows that both approaches of the Church to society are exhausted and in need of revision. From historic Churches people want that in which evangelical churches have been strong – greater attention to the individual, personal relationship with God, a living gospel, understandable sermons. People are demanding from the evangelical churches that which the historic Churches have historical assumed was exclusively their own – greater attention to the social dimension of faith, connection to the “big” tradition, to local cultural distinctives and the history of its people. Insofar as I represent the Evangelical Church, I will say more about this. Evangelical Christians sin in that they should have been serving their older brothers in the Christian family – with a personal touch and sermons of salvation. This emphasis on the personal, conscious, mature aspects has played a cruel joke on evangelical Protestants: they were carried away by personal concerns to the detriment of social responsibility. Active preaching of the gospel has turned into boring moralizing, “Word only,” becoming caught in the attraction of the spiritual dimensions to the detriment of solving visible and totally tangible problems. As a result, evangelical Protestants know all too well what “I” means, but do not know “we”; what the “word of God” is, but not how it is expressed in action and co-participation. Accordingly, the reaction of most evangelical Christians to Maidan was “neutral”: it is not our business, everyone should take care of their own concerns, and if they do participate in society, it is only through preaching. Mission has been reduced to calling people to join the Church. As Pastor Sergey Golovin says, instead of fulfilling the words of Christ to “go and make disciples,” evangelicals say “go and attract.” As a result, mission is “only” a service of the Church, while society remains without a transforming influence. Light shines “only” on its own, salt is distributed “only” to members of the Church. But that is not what Christ had in mind when he said, “You are the salt of the earth… You are a light to the world. A city on a hill cannot be hidden. When the lamp is lit, it is not covered by a bushel but put on a stand – and it gives light to all in the house. Just let your light shine among men… “(Matthew 5:13-16 ). In the last century theologians of the Lausanne Movement suggested that we speak about mission as transformation. For Evangelical Churches it was a radical rethinking of mission, when the call of the people from society into the church was supplemented by calling the Church to go into society and transform it. Having been begun in the global evangelical movement this work of updating missiology should be continued and at the national level. Obviously, the Evangelical Churches of Ukraine are not very familiar with the documents of the Lausanne movement. So, why then must mission be understood as transformation, why should the Gospel not only save individual persons, but also to transform society? Because “only” is a dangerous word. Because Christ’s teaching about the Church and its mission in the world was part of His teaching about the Kingdom. Because the global evangelical movement can offer us a rich experience of holistic missiology and inspiring stories of how the gospel changes the destinies of nations. The history of Ukraine may become one of those stories, and the responsibility for the realization of this possibility is placed upon Ukrainian Christians.